Strivectin has long been known for their skincare products, but did you know that they’ve now started a Strivectin Hair line? I was just as surprise — and skeptical, honestly. Part of me wasn’t sure if they could pull off hair care products as well as they do with skincare. Boy, was I wrong! An In-Depth Look at the IT Brushes for ULTA Brand! You guys know my love for the IT Cosmetics brushes, so it’s no surprise that I was curious, investigated, and have fallen in love with the IT Brushes for ULTA line that is available at Ulta Beauty. It can be a little confusing, with all the different collections and brushes within the IT Brushes for ULTA line….which is why I am bringing you this post today! I have been looking forward to sharing this comprehensive guide for weeks now so let’s dive right in! 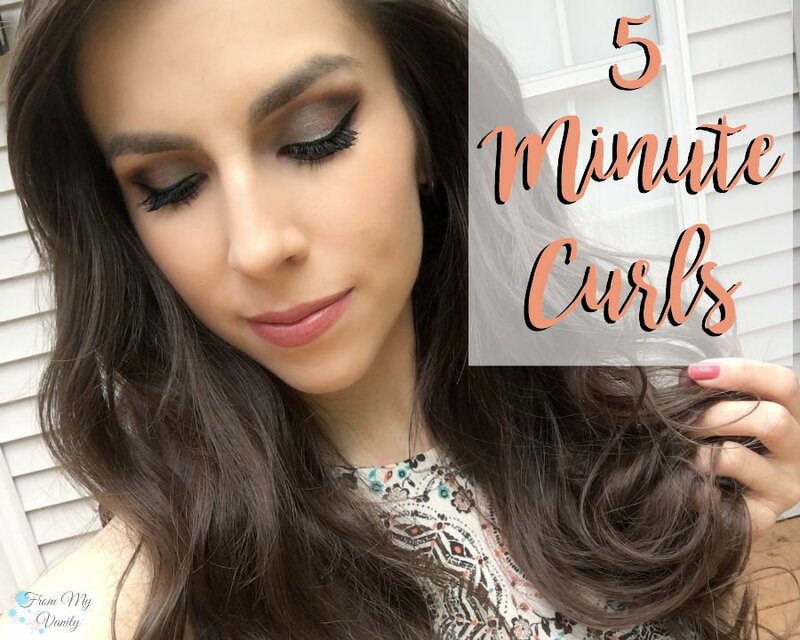 Effortless Curls with a ghd Flat Iron + Hairstyle Hack! Today I am excited to partner with ghd to bring you this easy, step-by-step tutorial on how to get curls with this ghd flat iron. Because if you can’t drop the money on two different hairstyling tools (I totally get it, they’re pricey and an investment!) you don’t have to own two different tools to achieve both straightened AND curled hair. It can all be done with just one really good flat iron. Quick Hairstyles for Busy Moms – Goody Makes it Easy! Every mom — whether you have one child or ten — knows that finding the time to do their hair and makeup can often be hard to get. I’m such a makeup addict that I’d prefer to spend all my free time doing my makeup, so I’m always finding new ways to elevate super-easy hairstyles so I can get ready and out the door in time. Today I’m sharing two easy hairstyles using my all-time favorite brushes — Goody! Ready to tame the frizz and crazy messy buns? It’s been a while since I’ve shared a hairstyling tutorial with you all. Have you missed them? Well, today’s your day, because I’ve teamed up with Toni&Guy (through Birchbox) and Kiss (through Brandbackers) to bring you another easy hairstyle that incorporates both curls and braids (You know those are the hairstyles I LOVE!). At the end I will also give you a short review on the products from both these companies. So let’s jump right in and have some fun! This is mainly to keep all those fine, baby hairs that are around your hairline from sticking up and giving your braid a ‘fuzzy’ look. (They drive me crazy!) The Toni & Guy’s Stick It Up Gum works perfectly for this. If you don’t know what dutch braiding is, it’s exactly like french braid — except that instead of braiding the strands over each other, you braid them under each other. If you still are not sure what dutch braiding is, head over to Youtube and check out Kayley Melissa’s tutorial on how to do a dutch braid. Use however many bobby pins you need to secure the braid at the back of your head. Make sure that you are pinning the braid underneath your hair, so that it will cover the bobby pins and make your braid look like it just disappears into your hair. At this point I sprayed my braid with Toni&Guy Medium Hold Hairspray to keep it secure. I didn’t want to go in with too strong a spray, just in case I needed to change things up. Always save the strong hairspray until you’re completely done and satisfied with your look. It took a few tries to figure it out, (You should have seen my puzzled look!) but once I did, I had a beautiful curl! And I like the fact that the wand wraps the hair around for you, so there’s less for your hands to do. 🙂 It also gives you a very natural, relaxed wave that I really liked. This is a step that I like to include, because my hair can be very stubborn. After I’ve curled a section of hair, I give it a light misting of Toni&Guy’s Sea Salt Texturizing Spray and scrunch it up just a bit. Once I finished curling all the sections of hair, I grabbed the Toni&Guy’s Strong Hold Hairspray and gave the curls — and my braid — a good misting to set the hairstyle. Toni&Guy is a high-end brand in the hair product world, so I was pleased to find that all the products feel luxurious and work better than the drugstore brands that I’ve tried in the past. This is a really important fact for me — I’m not just going to pay more money for the name, I want the product to be worth the price. And these are! I think out of all the products, I loved the hairsprays the most. I hate buying drugstore firm hold hairsprays, because I just feel like it’s spitting glue into my hair. My hair feels gross and looks like it would snap off if I tried to bend the strands. But with Toni&Guy’s hairspray, it gave me a firm hold on my hairstyle, without the “cement” feel. The texturizing spray, also, was exceptional. The nozzle just gives you a light misting and it isn’t as sticky as some of the sprays I’ve used in the pass. It does give your curls that slightly crunchy feel, but not overly crunch. Just enough to really grab onto the curls and help them hold throughout the day. This product would work well if you wanted to spruce up your curls partway through the day. All in all, while you are going to pay a few more dollars than the regular drugstore hair products, they’re definitely worth it! The products won’t leave your hair feeling gross the next day (big plus!). Toni&Guy feels and smells luxurious and the results I get with their products outshine the other hairstyling products I currently have underneath my bathroom sink. Definitely worth the splurge! After curling my whole head with this wand, I’ve been able to form a pretty definite opinion on this curling wand. Before I forget, it retails for $59.99 — which isn’t a bad or outrageous price for a hair tool, in my opinion. I will admit it took my several tries before I finally figured out how to work it without getting my hair all tangled on the prongs. (Now, this might just be because I can be a bit clumsy at times!) After reading the directions carefully and doing several trial runs with the wand turned off, I finally figured it out. Once I got the hang of it, curling my hair went really quickly. Because this curling iron has the prongs that help to keep the hair around the wand, it does also cause the hair around it to get caught up if you’re not careful. If you’re going to use this wand, you will definitely need to make sure you section off your hair and keep the hair separate from your curls. And even then, if I tried to rest the wand too close to my hair while twirling it, the curls I’d already done would start to get caught up around the wand! So, depending on the individual, this might be a con. For me, personally, I don’t mind it. I just have to keep it in mind when clicking the button to twirl it. One thing that I considered a negative aspect of this wand is that it is very hard to get a close curl when doing the sections at the back of my head. Because you can’t see it (or maybe because I’m not very flexible) I found it impossible to get the wand close to my head and curl the strand without the prongs getting all caught up in my hair. So for me, I just brought the hair around my shoulder and curled it as far up the strand as I could go. All in all, while this curling wand does have a few cons, I found that I really loved the curls that I was able to get with the Kiss InstaWave. They held up beautifully all day and still had a lot of curl left the next day. As I mentioned, I loved that the curl it gave was very loose and effortless. I don’t like ringlets when I curl my hair, but neither do I like fallen waves. This curling iron gave me the perfect curls. I think it will really come down to your own personal preference as to whether or not you will like this curling iron. If you love trying new and different hair tools, then you’re going to love this! Click to Watch a Tutorial on How to Use the InstaWave! think will be useful for my readers and I only recommend products I have personally used. All thoughts and opinions are 100% my own.